The month of April would be the forth year where I started my blog. Although my blog started longer than this, however, the first entry that I had archived till now is April 28th 2003. With the 4th year… I shall plan a series of celebration! So stay tune! Oops… This is a long overdue entry…. I am supposed to do this entry centuries ago… but only recently when I install Picasa… (I know… late boomer… but not because I don’t know, but I don’t want to… but I guess for the sake of blogging and to kill many birds (ie photos) with 1 stone… That would be the best solution. From the Asia Pacific Regional Rotaract Conference, I got to know Yi Hsing from Taoyuan. She was so nice to host us for our trip this time. 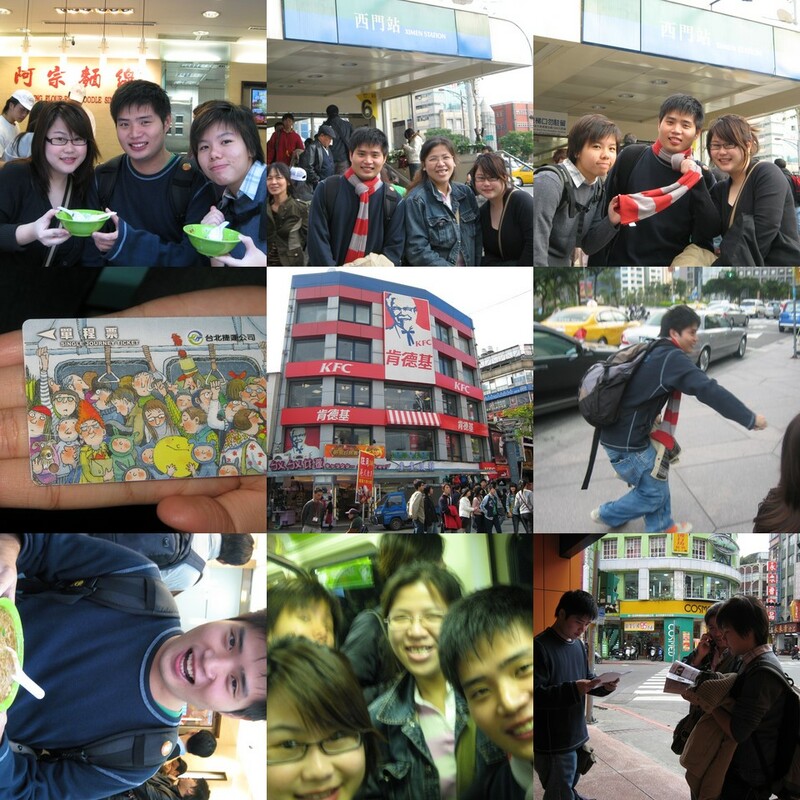 When you are in Ximending, how can you not miss the famous Ah Zhong Mian Xian? In a nutshell, it’s rice vermicelli noodles, with pig’s intestines/oyster in a thick brown gravy. After taking a mouthful… Woah! It’s heaven!!!! Singapore’s Mee Sua cannot compare to the original Taiwan’s Ah Zhong Mee Sua! Although over the shop, we have to stand and enjoy since there is no chairs or tables…but hey…who’s complaining when its such a delicious food. Be Warned..the Queue is long!! 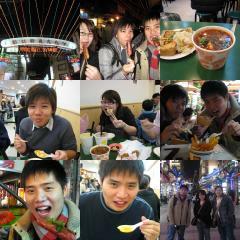 There is so much food in Ximending as it is quite a hugee area..so be prepare to have enough room to stomach. List of food that I consumed to be tabulate later. After in the afternoon, it’s the obligatory tourist trip to Taipei 101! Damn it, it’s damn tall! As you can see, I have to lie on the ground in order to take a full view of the building.. But what the heck… no one knows me anyway! 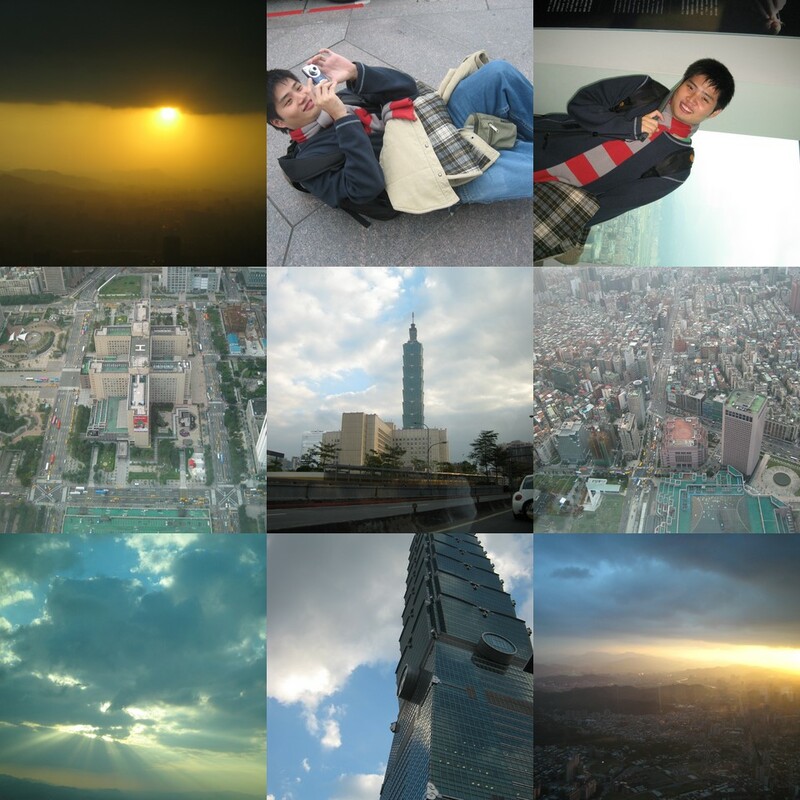 To go up to the highest level of Taipei 101 which is also the viewing gallery, we took the life which could take us up within 40seconds. Even taking the life is an entertaining experience…. After visiting Taipei 101, we stopped by a donut cafe and Macs for a snack. After that, we went to one of the night markets of Taipei…woah …more food….As we walked along the night market…we snacked on taiwan sausages, fried snacks and finally settled down to a tiny eating place that specializes in Smelly Tofu. I was surprised that the smelly tofu here is not as pungent as those I had in Singapore. It is more palatable and it taste quite good. We ordered a normal tofu and spicy tofu. After walking a bit more, we headed to Cheng Ping, a 24 hour bookstore and that’s where i got a jap 3d book as a belated birthday present. After that, we headed back to the hotel for a good night rest.